A while back I was reading Artificial life. A report from the frontier where computers meet biology (Levy, 1992). In this book, Levy describes the development of the scientific field of artificial life till the 1990s. Although I think the book was less readable than his work Hackers (Levy, 2010), it was still an interesting read. What piqued my interest most in Levy’s book on artificial life was the idea of generating plant-like structures by means of a rewriting system known as an L-system. I downloaded the book and started reading it. Chapter 1 is introductory material introducing the L-system formalism, its extensions, and a way to render these L-systems. The authors render the L-systems by interpreting it in terms of turtle graphics. Turtle graphics is quite a simple way of thinking about drawing things with a computer: given a turtle holding a pen, tell the turtle where to move, to rotate, and to push the pen to the paper or not. Seeing the turtle interpretation, I tried to read (Prusinkiewicz & Lindenmayer, 1990) using a constructionist approach by building the examples myself. After a couple of fun hours programming these prototypes, I decided to write my own virtual botanical laboratory because I assumed that the software described in The algorithmic beauty of plants would not exist anymore. Later, when I had finished most of the engine of my virtual botanical laboratory, I discovered that the group who put the book on-line also have put their software on-line as well. Figure 1.1 How much fun: I generated an odd looking tree! In the next Chapter, the virtual_botanical_laboratory is introduced by enumerating the examples from Chapter 1 of The algorithmic beauty of plants defined in the virtual_botanical_laboratory. After that introduction, the use of the software a description of the user interface, followed by 2) an overview of the L-system language. Finally, building the software is discussed, including a list with to do items. How to run this example on your own is explained in the next section. and open the HTML file in a modern web browser! For more examples, please see the examples. For more information about creating and configuring L-systems, see the chapters below. virtual_botanical_laboratory is free software; virtual_botanical_laboratory is released under the GPLv3. You find virtual_botanical_laboratory’s source code on github. In this Chapter all examples in the first Chapter of the book The algorithmic beauty of plants, Graphical modeling using L-systems, are recreated using the virtual_botanical_laboratory. I recommend you read the book’s chapter while exploring the examples. In doing so, you will get familiar with the syntax of defining a L-system. Note. Sometimes doing another derivation might crash your browser. The interface is meant to show the generated images while giving the user access to the underlying L-system and the configuration of the interpretation of that L-system. On the main tab page, labeled with ♣, you can see the rendered L-system (see figure below). It also has some buttons to control the L-system and export the rendering. ★ (New): create a new empty virtual botanical laboratory in a new window. 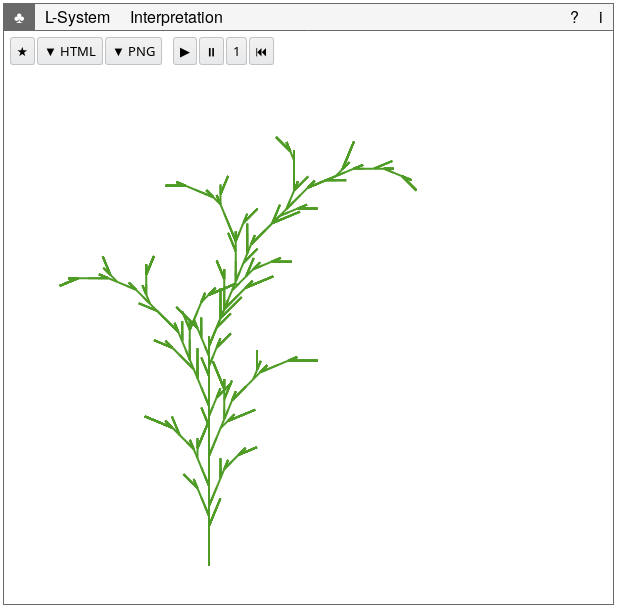 ▼ HTML (Export to HTML): export the virtual botanical laboratory to a HTML file. By default, this file is named after the L-system. ▼ PNG (Export to PNG): export the rendered L-system to a PNG file. By default, this file is named after the L-system. ▶️ (Run): derive new successors for the L-system until it has reached the derivation length set by property derivationLength. You can set that option on the Interpretation tab. ⏸ (Pause): stop deriving new successor. 1 (Step): derive the next successor for the L-system. Note. Due to the inefficiencies with respect to memory, this might crash your browser. ⏮ (Reset): reset the L-system to the axiom. 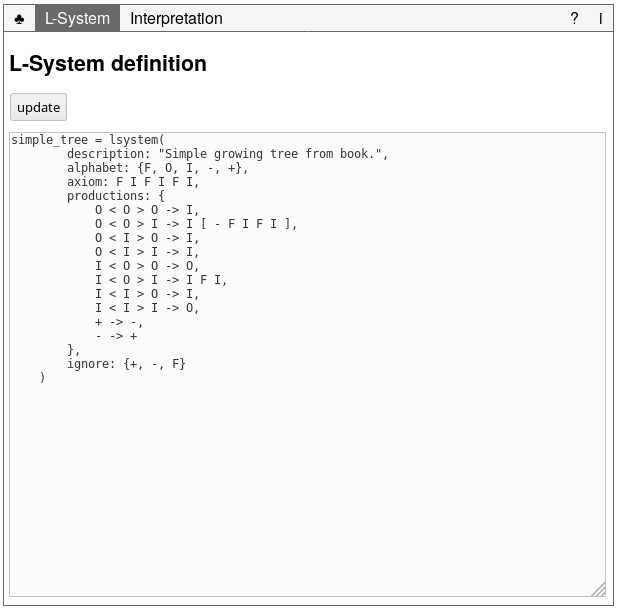 You can view and edit the L-system definition on the L-system tab (see figure below). When you change the L-system, press the Update button to have the changes take effect. This will parse the L-system’s definition. If you make an error, a warning is displayed. If everything is okay, a temporary information message to that effect is shown. Switch back to the main tab to see the changes in action. 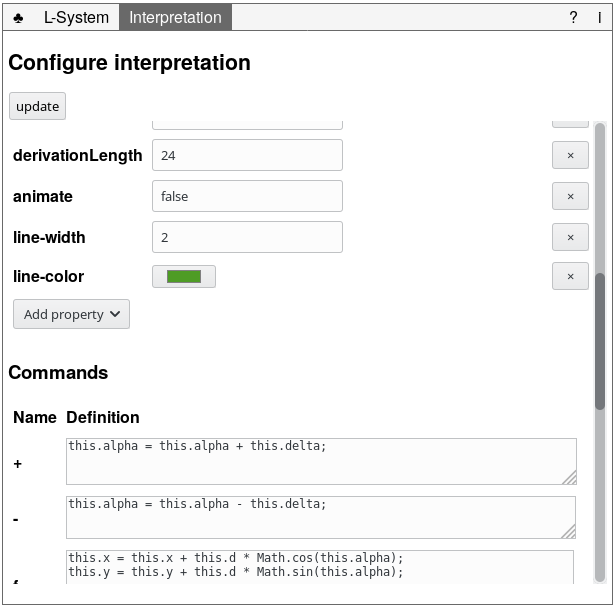 You can view and change the configuration of the interpretation on the Interpretation tab (see figure below). Commands, which is a list of all commands defined in the L-system. You can edit their definitions. Note. the this refers to the [Interpretation](https://heerdebeer.org/Software/virtual_botanical_laboratory/documentation/api/Interpretation.html). You can read a short manual on the Help tab (labeled ?). You can read about the virtual_botanical_laboratory and its license on the About tab (labeled i). Symbol names should be separated from each other. If you want to denote an F followed by another F, write F F rather than FF. Symbols can have names of any length larger than 0. So you can use symbol Forward instead of F if you so please. 3D aspects of the language have not yet been implemented. Language features described outside of Chapter 1 of Prusinkiewicz & Lindenmayer (1990) have not yet been implemented. Next the features of the L-system definition language are briefly introduced. For a more thorough overview, please see the (Chapter on reading Prusinkiewicz & Lindenmayer, 1990)(#reading). An alphabet with symbols, such as F, -, and +. The axiom or the initial string of symbols, such as F F.
A list of rewriting rules called productions, such as F -> - F + F.
Identity rewriting rules like + -> + can be omitted. If there is no rewriting rule specified for a symbol in the language, the identity rewriting rule is used by default. This will generate some expanding circle of branching lines. Stochastic L-systems. To bring some randomness into your generated plants, you can configure different successor patterns for one symbol and indicate the likelyhood these successor patterns are chosen by prepending each successor pattern with a numerical probability. The sum of these probabilities must be one (1). + < F -> f + F.
The left context is indicated by the string before the < operator. You can indicate the right context by a string after the > operator (not shown in the example). Here the F' symbol has parameter x. The successor to F'(x) differs depending on the value of x. These rewriting rules are conditional. You can define symbols with one or more parameters. Conditions can be complex by using Boolean operators and, or, and not. Also note the definition of global values dx and ddx. Note. The virtual_botanical_laboratory is quite SPACE inefficient. This is fine for the prototype it is now, but this issue needs to be addressed when continuing the project. If you plan on extending or adapting the virtual_botanical_laboratory, see the API documentation. The virtual_botanical_laboratory is still a work in progress. With the current version you can explore much of the material in the book The algorithmic beauty of plants (Prusinkiewicz & Lindenmayer, 1990). Some more advanced features from later in that book needs to be implemented still. An improved user interface. The current interface is just a placeholder. Enough to configure and experiment with l-systems, but in not user-friendly. Feel free to replace it with something better, pull requests are welcome! make derivation and rendering cancellable. Levy, S. (1992). Artificial life. A report from the frontier where computers meet biology. New York: Vintage books. Levy, S. (2010). Hackers. Sebastopol: O’Reilly.